My little girl loves looking at old pictures of herself. I am going to surprise her with a special gift for Christmas where she is the star of every page. 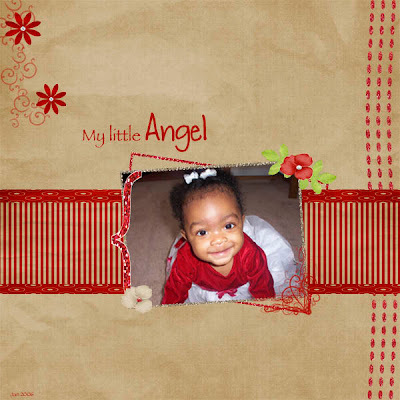 I am working on a 2o page scrapbook made just for her. The layout above will be included in her book. Kayla is 9 months old in this picture. I found a cute 8x8 scrapbook at Big Lots. Word Art by Tammy D.
Romance and Blues by Brenda Smith Designs.